Pyongyang’s missile failures must be seen for what they are – teething issues the Kim regime is determined to overcome. Following the test of an underwater missile ejection system of the first submarine-launched ballistic missile (SLBM) of the Democratic People’s Republic of Korea (DPRK) in May this year, North Korea conducted an even more ambitious test towards the end of last month – a flight test of the aforementioned SLBM, the Bukkeukseong-1 or “Polaris-1” missile. Despite the test being conducted from a floating barge, implying that Pyongyang lacks the confidence or capability for a full-fledged underwater test, the Bukkeukseong-1 failed upon launch, with missile debris subsequently seen floating in the Sea of Japan. But even as anti-DPRK watchers might feel a sense of schadenfreude when Pyongyang’s missile development team stumbles and falls, or even snigger at the lackluster qualities of their missiles, gloating is not only premature but ill-advised. Based on available information, the North Korean Bukkeukseong-1 is likely a copy of the obsolete Soviet SS-N-5 “Sark” SLBM. Taking the development of the Sark as a guideline for the operational introduction of Pyongyang’s first SLBM, it can be seen that the Soviets took about four years from 1958-1962 to design and flight test the first SS-N-5. Notwithstanding the fact that Moscow’s missile research was backed by the full scientific and industrial muscle of the USSR, while Pyongyang has to make do with the decidedly inferior military-industrial complex driving its missile program, the latter can take however long it needs, and make all the blunders necessary (no matter how embarrassing) to build and deploy its first successful SLBM. It is of little comfort to Washington, Seoul and Tokyo whether the Korean People’s Navy fields its first SLBM in 2019, or takes twice the time the Soviets did, and puts SLBMs out to sea in 2023. Next, those who decry the North Korean “Polaris-1” as being inferior or retrograde, citing the missile’s predicted short range of 890 nautical miles, which makes even a strike on Guam improbable, and its poor accuracy (only 50 percent of all missiles are likely to land within 2.8 km of a target), should note this is only the DPRK’s first SLBM prototype. As long as the Kim regime endures, its missile research and manufacturing sector can adopt a long run time horizon to implement modifications and improvements to this missile while it is still a prototype. Consequently, the final successfully flight-tested version might be a far more threatening creature than the one designed in the initial blueprints. As proof of the non-static nature of North Korean missiles, it can be seen that the DPRK’s introduced missiles have increasing range and capabilities. From the Hwasong-5 in 1985 with a range of 320 km and a 1000 kg warhead, to the Rodong-1 in 1990 with a 900-km range and identical warhead, and finally the Taepodong-2, the technological basis for the Unha rocket which successfully lofted a satellite into space on December 12, 2012, it is evident that Pyongyang’s scientists and engineers remain determined to advance their nation’s missile forces. It can thus be safely assumed that they will be equally committed to their SLBM project. As noted above, Pyongyang will continue to prioritize the development of ballistic missiles for as long as the Kim regime is in charge. Based on the late Kim Jong-il’s governing policy of Songun, in which the military is used as the principal source of political power in order to ensure regime security – a policy that endures under his son, Kim Jong-un – the development of North Korea’s land-based and now submarine-borne missiles will continue to be funded and supported by all the human talent and material resources the DPRK is able to muster. From the perspective of the younger Kim and his father, missiles and nuclear warheads form two halves of the deterrence against any U.S. or foreign plan to bring about regime change via military force, and are consequently given priority over other concerns like economic restructuring or civilian welfare. Fundamentally, it helps to understand that North Korea is arguably functioning with a wartime economy that has more in common with that of Germany during World War Two rather than any socialist client state under Soviet influence during the Cold War. Correspondingly, Berlin’s focus on the development of Wunderwaffe, or wonder weapons like the V-1 flying bomb (the first operational cruise missile) and the V-2 rocket (the first operational ballistic missile), are paralleled in the DPRK by the latter’s dedication to the building of land- and sea-based ballistic missile capabilities. Insofar as Pyongyang appears determined to acquire a “triad” of delivery systems (land based missiles, bombers and sea-borne missiles) carrying either conventional warheads or WMD (either nuclear or chemical warheads) payloads in order to preserve a “second strike” deterrence capability, it would behoove the U.S., South Korea and Japan to cultivate a healthy respect for North Korean efforts to nurture the latter’s missile development, of which the Bukkeukseong-1 SLBM is the most recent example. Accordingly, the best that Washington, Seoul and Tokyo can do is to adopt a two pronged strategy of utilizing their collective international influence to ensure the proper enforcement of the United Nations Security Council resolutions barring all transfers of missile or heavy weapons related technology to the DPRK, (Pyongyang apparently reverse engineered its SLBM from a few SS-N-5s acquired at the end of the Cold War), while bolstering their military defenses against North Korean ballistic missiles. 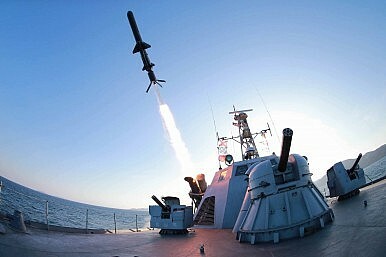 Towards this second priority, the U.S., South Korea and Japan should maintain a robust anti-submarine warfare presence in the region to counter any of the DPRK’s ballistic missile submarine deployments, while making national missile defense (the Korean Air and Missile Defense System of South Korea is an example) a top funding and implementation priority. Nah Liang Tuang is an Associate Research Fellow at the Institute of Defense and Strategic Studies, a constituent unit of the S. Rajaratnam School of International Studies (RSIS), Nanyang Technological University. There is only one feasible choice for solving the issue: treat Pyongyang as a rational actor.